Found on the coast, about 50Km east of Malaga, Nerja is famous for the "Nerja Caves" and the "Balcon de Europa" with its stunning views over the Mediterranean Sea. Nerja is really worth a visit. You can do so by requesting a personalised excursion or day trip with Malaga Airport Transfers. We also arrange your airport transfers from Malaga, you can view our prices and book online using the form on the top. Currently our best offer on a transfer is about 69 euros for a standard cars. 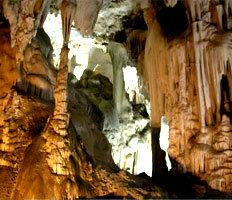 The caves of Nerja were discovered in 1959 when primitive paintings were found. The Nerja Caves are now believed to be just the entrance to a linked series of potholes stretching many miles into the mountains. Located in the old town of Nerja and surrounded by shops, bars and restaurants, "Europe's Balcony" offers stunning views across the sea. With some of the most beautiful beaches in the province of Malaga, Nerja is perfect for a sun-soaked holiday. We love Burriana beach; Maro, Calahonda beach, Carabeo and Carabello beaches, not to mention countless other rarely visited little coves. 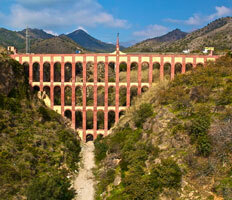 The 19th-century Eagle Aqueduct, the Baroque Hermitage of Las Angustias (which dates back to the 17th century), the Church of El Salvador and the Nerja History Museum are all well worth a visit, too. Like the sound of Nerja and planning a holiday or trip? 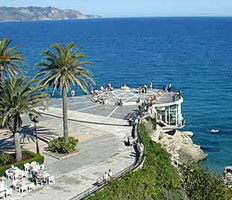 Find out the great prices we can offer you on cheap airport transfers to Nerja. It’s simply the best possible start to your holiday.